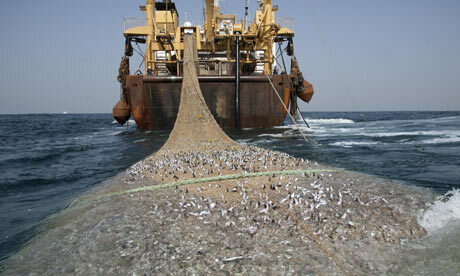 Overfishing is becoming increasingly recognised for the ecological disaster that it is. The capacity of the global aggregate fishing fleet is at least double of what is needed to exploit the oceans sustainably, and fishing methods such as industrial bottom trawling have proved particularly destructive. NGOs and other development actors can play a crucial role in monitoring the way that resources are managed and benefits are shared. They must look at the oceans, seas, lakes and rivers with the same scrutiny that is now applied to the management of farmland, forests and other terrestrial resources. Consider the rise in atmospheric carbon dioxide, leading to increased sea temperatures and ocean acidification, oil spills, agricultural and industrial run-off, pollution from aquaculture, and the enormous accumulation of plastic debris in water, and the critical situation for marine wildlife becomes clear. But less is said and written about the social dimensions of this disaster. This is not simply a case of an industrial sector hurtling down a path to its own economic extinction. There is also a whole way of life at stake for some of the world's most vulnerable communities. In parallel to industrial trawlers and distance fleets, some 12 million small-scale fishers operate in coastal and inland marine areas across the world, deriving vital income and dietary protein from fisheries in a way that contributes crucially to the food security of whole communities. Data shows that small-scale fishers actually catch more fish per gallon of fuel than industrial fleets, and discard less fish. And 22 of the 30 countries where fisheries contribute over a third of total animal protein supply are low-income food deficit countries – and therefore among the most food insecure. The depletion of fish stocks, the degradation of marine environments and the encroachment of industrial fleets therefore poses a major existential threat to these traditional fishing communities. It could also affect the development and humanitarian work in developing countries. The impoverishment of coastal and inland marine areas could also accelerate the rural-to-urban migration, compounding the problems that the rural exodus has already engendered – overcrowding, the growth of slums, pressures on infrastructures, and a difficult transition away from the only lifestyle and livelihood that communities have known. Therefore, when tackling the fisheries challenge, a dual approach must be taken that not only clamps down on harmful industrial practices, but also actively supports small-scale, artisanal fishers so that they do not have to leave their fishing grounds. Licence and access agreements allowing waters to be fished by industrial fleets must be subjected to the same scrutiny as land acquisition deals which hand 'under-developed' farmland to multinational investors. What will be the impacts on small-scale actors and their communities, and have they been consulted? What compensatory provisions will be made for them? Who will oversee the agreement? The development community must be as vigilant in the face of 'ocean-grabbing' as it is in the face of 'land-grabbing'. Advocacy efforts can then be focused on securing the ability of small-scale fishers to sustain their livelihoods in the face of these threats. This could take the shape of supporting the creation of exclusive artisanal fishing zones, bottom-up co-management schemes that favour local user rights, and cooperatives allowing small-scale fishers to defend their rights and rise up the value chain. The development community's vital efforts to sound the alarm on land-grabbing helped to drive forward the agreement of international land tenure guidelines at the FAO's Committee on World Food Security in 2011. Similar efforts must now be mobilised in order to ensure that the FAO's international guidelines for securing sustainable small-scale fisheries, to be negotiated in 2013, involve the active and meaningful participation of fishers' organisations. This must go hand in hand with advocacy efforts centred on tackling industrial overfishing head-on. Here the treaties have already been agreed but are poorly applied. The development community must therefore play an ever-stronger role in pushing for implementation of the agreement on port state measures to prevent, deter and eliminate illegal, unreported and unregulated fishing – the first binding agreement of its kind, adopted in 2009, while taking into account the role of occasional fishing as a safety net in times of crisis for some coastal communities and recognising the essential difference between unreported fishing by small-scale fishers and illegal industrial fishing. Development actors must also be unrelenting in calling for implementation of the Johannesburg Plan of Action, which mandates the reduction of states' fishing capacities and the creation of marine protected areas, while taking into account the food security of coastal fishing communities. This is not yet a humanitarian crisis – but could easily become one if the path of travel is not radically reversed, and development actors have a crucial role to play in bringing about this reversal. Olivier De Schutter is the UN Special Rapporteur on the right to food. On November 2nd he presented an official report entitled 'The Right To Food' to the UN General Assembly.